After a long pause, we’re happy to present a new release of NeatMouse. Having a version 1.03.001, it opens a road for the long-awaited features. ”sticky keys” feature. It can be used to activate “press and hold” mouse action, which might be useful to perform drag&drop or massive selection of items. For example, if you have sticky keys modifier set up, you can hold it and press the key responsible for left mouse button event. Now your left mouse button is “trapped“ and considered as still pressed even after you release all the keys. To “untrap” it, just press once again the sticky keys modifier – or the key bound to your trapped mouse button. In the same way you can “make sticky” the middle mouse key – this could be useful, for instance, if you want to achieve automatic scrolling. 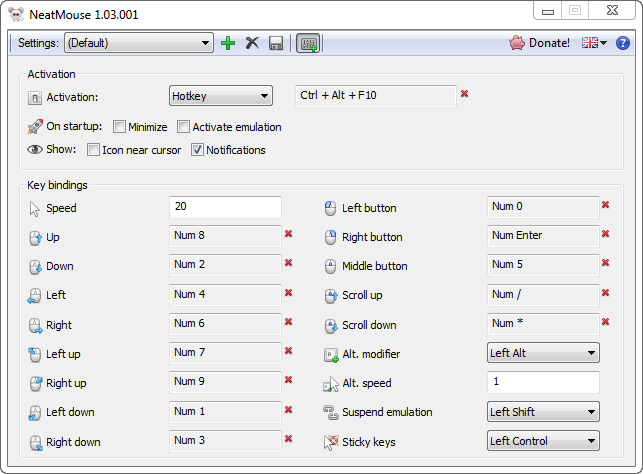 Download NeatMouse 1.03 right now! Have a perfect summer and stay tuned – more releases are to come!